Institute produced another sparkling second half display to easily defeat nine man Knockbreda 4-0, at Drumahoe. It is now seven goals in three games for Shane McGinty, as his hat-trick along with Michael McCrudden’s first goal since his return from Ballinamallard United, ensured the Waterside men cruised to victory. The victory sees Kevin Deery’s side move up into eigth spot just nine points behind second placed Harland & Wolff Welders having played a game less. On four minutes Michael McCrudden played in Gareth Brown, but the striker’s close range strike was kept out by goalkeeper Ryan McBride. Minutes later Brown was inches away from scoring when Ciaron Harkin’s right wing centre into the six yard box, flashed just in front of the striker. On 20 minutes McCrudden broke in behind the visitors defence, but he dragged his close range strike wide. Moments later Stute goalkeeper Martin Gallagher was called into action when he made a super point blank range save to keep out David Johnson’s effort. Just after the half-hour mark Institute were denied the opener when Mark Scoltock’s shot was cleared off the line by Matthew King, after his drive from 16 yards had taken a slight deflection on the way towards goal. The home side deservedly took the lead in outstanding fashion thanks to McGinty’s fifth in three games on 47 minutes. 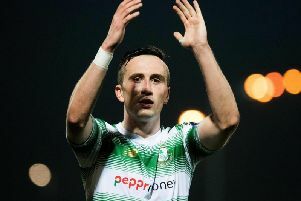 The midfielder won a challenge some 30 yards from goal, before running at the Knockbreda defence and making no mistake from 25 yards despite McBride’s best attempts. Soon after the Waterside men doubled their advantage when a super run and pass by McGinty found McCrudden inside the box and his side footed effort from six yards went in off the out-rushing McBride. Institute netted a third goal on 58 minutes following another flowing move which was ended off by Jamie McIntyre’s cut-back from the right being blasted home by McGinty. The visitors’ miserable start to the second half continued on 67 minutes as they were reduced to ten men after David Johnston was shown a straight red card for an off the ball incident. Incredibly Knockbreda had another man sent-off a few minutes later when Owen Beggs was rightly shown a second yellow card followed by a red for a challenge on Ciaron Harkin. Midfielder McGinty completed his hat-trick on 71 minutes from the penalty spot, sending McBride the wrong way, after Jamie Dunne was barged to the ground inside the box by Kyle Owens. Nine minutes from time another slick passing move ended with Brown’s close range side footed effort, hitting the side netting. Institute: Gallagher, Roddy (McDermott 63), O’Donnell, Scoltock, Morrow (Dunne 32); C Harkin, McGinty, A Harkin; McIntyre (Mills 77), Brown, McCrudden. Knockbreda: McBride, King, Cockcroft, Ferguson, Owens, McCain, Hanna, Johnston, Wilson, Beggs, McMaster.